Znoud el sit is a Lebanese dessert made of filo pastry ( like puff pastry or spring roll pastry) which is available in the middle Eastern grocery frozen section. 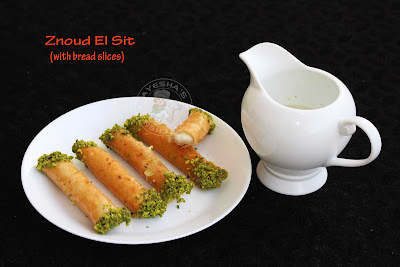 But many of us are unable to get this pastry easily and so here is an easy method for making this melt in mouth Lebanese dessert at home. I substituted bread slices instead of fillo sheets. Bread snacks and bread desserts are pretty easy to make and delicious too. This dessert using bread is also one among the same. 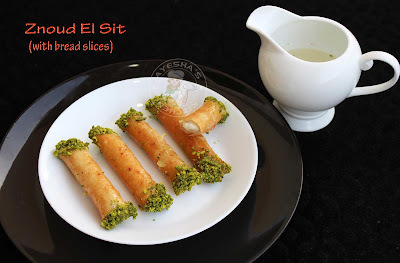 Quite easy to make and is really delicious in each bites. Here white bread slices are flattened, stuffed with cheese, rolled, deep fried and then dipped in flavored syrup. Sugar syrup is flavored with rose water and orange blossom water. As I don't have orange blossom water, I skip the same. You can use thick cream or ashta cream ( made with cornflour and condensed milk ) instead. 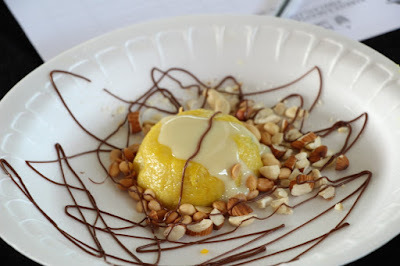 Hey sweet lovers, this dessert recipe or sweet recipe with bread is for you. You can attract your guests with this inviting and attractive sweet. 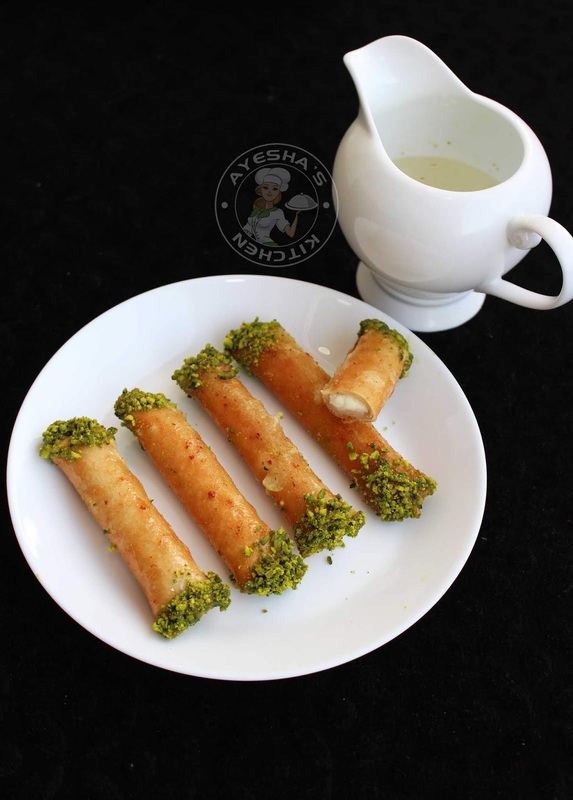 Hope you all like this lebanese dessert and do try at home atleast once. 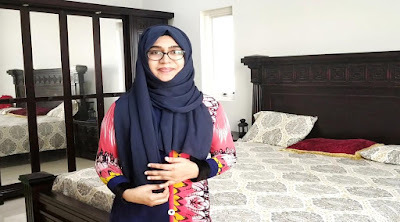 Drop your feedback and please subscribe my channel Ayesha's kitchen if you like my videos . Prepare the sugar syrup and set this aside ready. Heat sugar and water in a pan. Once sugar melts and starts boiling, simmer the flame for 5 minutes. Then add lemon juice and rose water . Off the flame. No need of reaching one string consistency. Trim the sides of the bread. Flatten it out using a rolling pin. Cut the cheese cubes lengthwise and then place inside the flattened bread slice. Roll them tightly. Apply some maida mixture along the sides and press tightly so that it will stick thorougly. Repeat the same with the remaining bread slices and then freeze it for 5 minutes wbich helps the bread to absorb very less oil only while frying. Now heat veg oil or sunflower oil in a pan. Once hot, make the flame to medium and then fry these bread rolls until Golden. Do not fry over high or low flame. Once done transfer it to a plate and then dip it in the warm syrup. Do not dip the bread rolls in the syrup for long. Just for 1 minute and trasfer it to a plate. Immediately coat both the extremities with pistachios powdered. Kerala snacks are loved by most of the malayalis and even these snacks are very popular among present generation also. 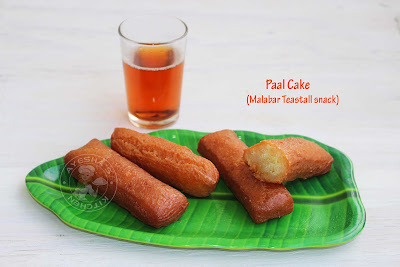 Some authentic malabar snacks or kerala snacks always impart a nostalgic taste like pazham pori, neyyvada, unnakaya, unniappam, chattipathiri, neyyappam, paal cake, kalthappam etc. Recently I have shared a detailed recipe blog and video showing how to make neyvada at home. This time am with yet another kerala Teastall snack or sweet recipe. 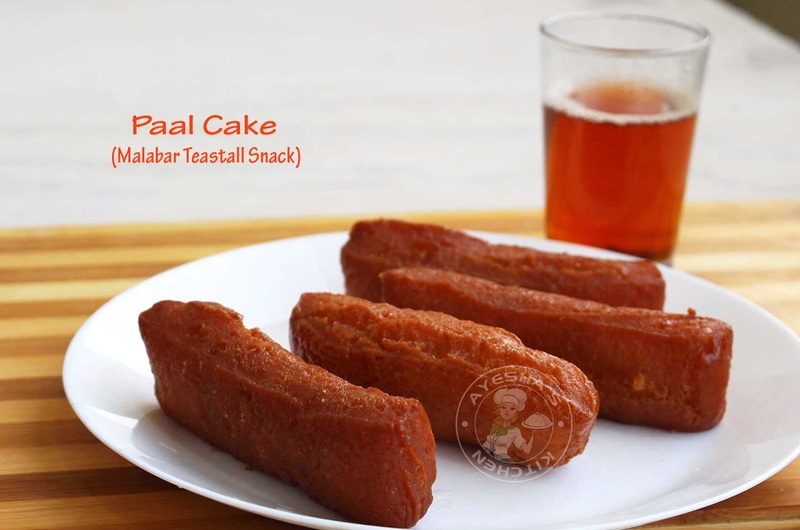 Paal Cake is a very popular teastall sweet or snack and it's taste resembles almost that of neyvada. For me, paal cake is a sweet accompaniment to evening tea especially when it is raining outside. Those rainy days with gloomy skies and me with a cup of black tea without sugar accompanied with this paal cake, a nostalgic feel , right? But this snack is surprisingly lesser known even in other districts of kerala. Really it's a mouthwatering sweet for me. Though this cake is named as paal cake which means milk cake, it is a sweet without milk. 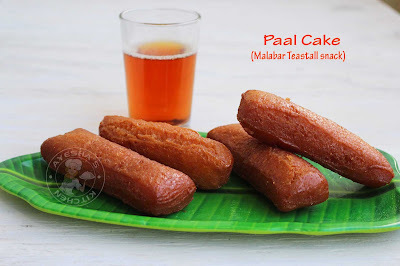 Paal cake has a crispy crust with soft juicy inside. So do try my paal cake recipe and drop your feedback. Mix this flour mixture well with a spoon and then add softened butter. Combine well with your fingers. To this, add the melted ghee little by little. The ghee must be mixed well with the flour. Combine well to form a bread crumbs texture. For kneading this flour mixture to a soft dough, combine together egg white, curd, and sugar in another bowl.. Add this egg mixture little by little to the flour mixture and knead well to form a soft dough. You must knead the dough very well. Keep this dough aside covered for half an hour. Meanwhile let's make the sugar syrup. Boil sugar, water and cardamom in a pan until it form a one string consistency. Then add lemon juice. Mix well and off the flame. Now the dough for paal cake will be ready. Do not knead the dough at this stage, but roll and flatten the dough using a rolling pin to form a rectangular shape with minimum thickness. Then cut it into desired shapes or same like pal cake. Heat a pan with oil for deep frying. Once hot, drop the prepared cakes to the oil and then make the flame to medium low. You must cook the cakes over a medium flame only else results in an uncooked paal cakes. Fry until both sides turn golden. When done, transfer it to a plate and immediately put them in warm sugar syrup for 3 to 5 minutes or until the next batch is ready. (you can heat the sugar syrup for a minute if it is cooled). Do not keep the cakes in syrup for more time. After 3 to 5 minutes, transfer it to the plate and allow it to cool down before serving for best result. You can store them in the refrigerator for 2-3 days. Some chicken dishes are always so addictive and impressive. And no doubt, such chicken recipes tastes amazingly delicious in each bite. This chicken dish is a special recipe which i prepared for Valentine's day. I know we all will be browsing for something special to surprise your loved ones. I though of sharing a surprise cookie chocolate for this Valentine's day. But my viewers are requested for a spicy treat. So I will be sharing that cookie chocolate only after Valentine's day. Yes, for sure this chicken dish is such a delicious treat. 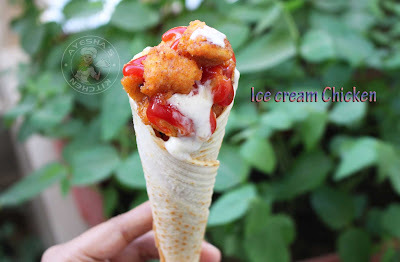 The Icecream cones are very easy to make at home. You can either bake it in the oven or can easily prepare it in a frying pan. A fun and an exiting way to enjoy with your Valentine. My Valentine' day treat to Ayesha' s kitchen viewers. The filling for this Icecream chicken is up to our choice only. Here I prefer veggies like cabbage, carrot and bell peppers wbich are very finely chopped. And for extra flavoring, I prepared some garlic mayo dip. Just blend mayonnaise and garlic in a blender and then mix it with lemon juice and pinch of salt to balance the taste. Yup ,this chicken starter is bursting with tender juicy spicy chicken, favorite veggies, garlic mayo sauce and the sweet crispy cones is just out of this world. Don't forget to drop your feedback after watch related video. And please subscribe to my cooking channel Ayesha's kitchen for more videos. Let's make homemade icecream Cone. 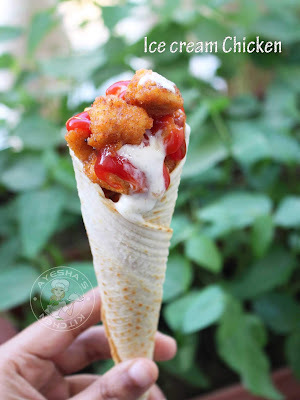 You can use store bought icecream cone instead. Now mix together all the ingredients given under for making cone in a large bowl. Add one by one and mix very well ( first whisk the egg whites very well, then add sugar and sakt. Mix well. Add oil, milk, vanilla essence and then add sieved flour ). Make a smooth thick lumps free batter. No need of adding water. Once the batter is done, heat the pan. Once hot, reduce the flame to medium low and then pour 2 tbsp of this batter. Flatten it with a spoon. Cook both sides until slightly golden. Once done, immediately shape it into a cone which is very important. The cone will be crispy and crunchy once cooled. Now lets prepare the chicken. Marinate the chicken cubes with chilipowder, turmeric powder, tomato sauce, lemon juice, cornflour, maida, salt. Coat this marinated chicken with bread crumbs and set aside. Heat oil in a pan for deepfrying. Once hot, reduce the flame to medium low and then fry until golden . Once done, transfer it to a plate. Chop the carrot, cabbage, bell peppers very finely and set aside ready. Blend garlic and mayonnaise in a blender until smooth and then add lemon juice and a pinch of salt. Let's assemble this Icecream chicken. 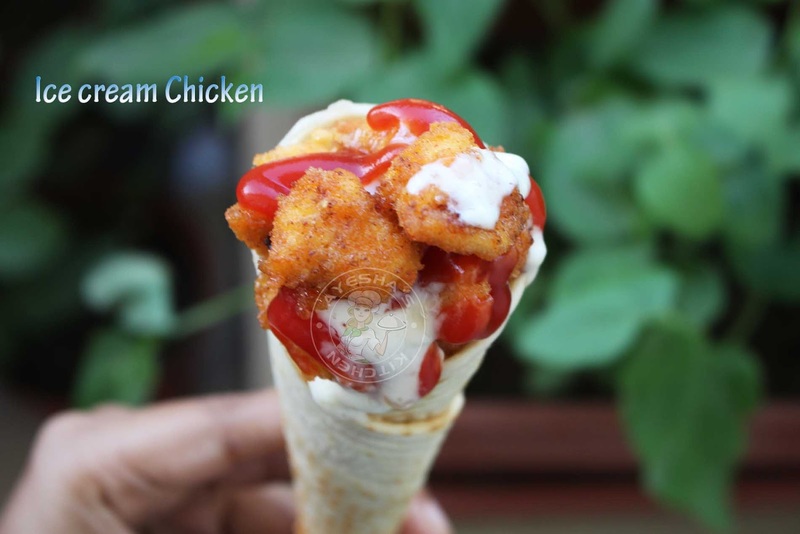 Take an icecream cone, spread garlic mayo, add veggies, add fried chicken followed by garlic mayo and veggies. Garnish with tomato ketchup and garlic mayo. Serve and enjoy the crisoy crunchy sweet and spicy chicken treat. 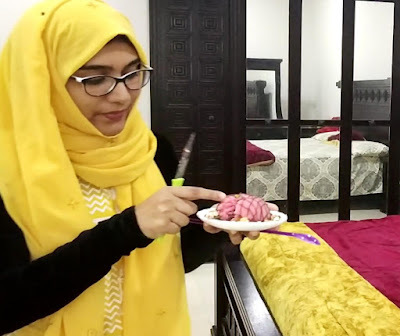 Kindly Subscribe to my channel Ayesha's kitchen for more videos. Hi foodies. Welcome back to Ayesha's kitchen, the taste of Malabar. These days I was little busy with my family and guests. My guests knew that am a food blogger and a Youtuber too. So they always expect some outstanding dishes and desserts from me. Every weekend I prepare some desserts as I know that I have guests the next day. So I prepare puddings or related desserts on those days as my daughter and my husband never finish such sweet treats. I don't have a serious sweet tooth but I crave for a sugary sweet or some desserts after my lunch meal and dinner meal even am completely full. My little kid always craves for cakes only. She is the big sweet tooth baby in our home. 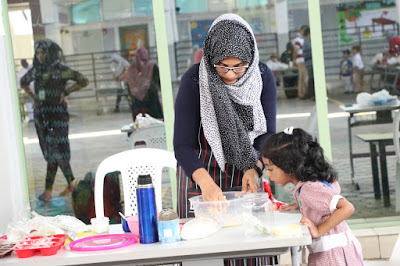 A few months back, I had participated in a cooking competition. A fireless cooking competition conducted by Habitat school, um al Quwain. 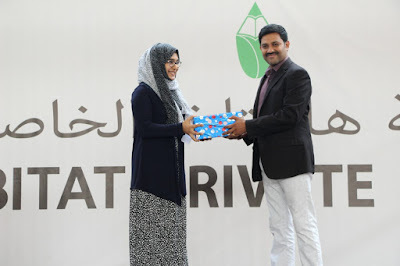 My kids are studying in that school and I was forced by my friends to participate in that competition. 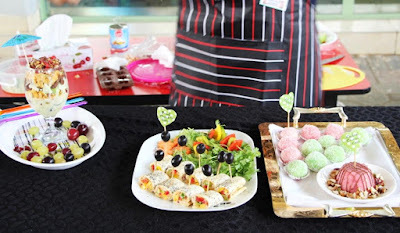 The contest was on October 16, 2018, as a part of the World food day celebration. It was for Kinder garden parents and kids only. All those fireless recipes were very innovative with an eye-catching presentation. 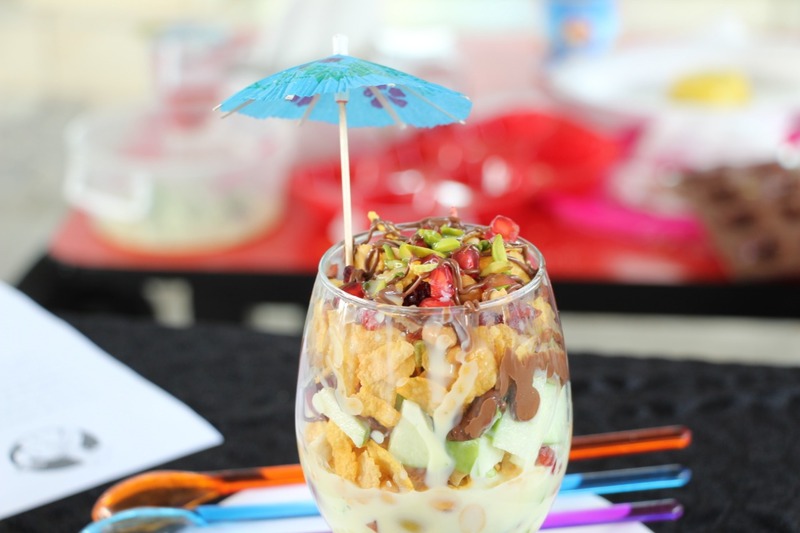 As the competition was based on no-cook no fire recipes only, the recipes proved that even without fire one can make smackingly delicious dishes within no time. Vegetable salads, chat recipes, biscuit rolls, bread recipes and bread sandwiches, lollipops, fruit salads, cocktails and juices etc were some of those no fireless recipes. I made five recipes in one hour. 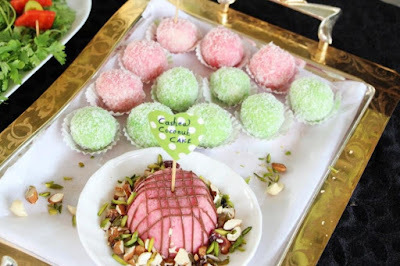 Cashew coconut cake, coconut laddu which I named as snowballs same like Raffaello candy, Marzipan with powdered cashew, mortadella rollups and royal fruit salad using fruits and nuts. And I won the contest. Yes, I participated in a food competition for the first time and got the first position too. My little (big) joys of life. I have already shared the recipe video for bread roll or bread sandwich. You can watch the video for Mortadella bread rolls here. This fireless sandwich is pretty interesting to make and kids will love that sandwich for sure. You can even pack this bread rolls in their snack box too. I hope you all watched my video for MARZIPAN. If not kindly watch and here is the video link Marzipan. Like so cashew coconut cake is another center of attraction in that contest. The video for the same is here Cashew coconut cake.